How many of us will know what to do to prevent our lives from spiraling out of control when we encounter traumatic events that threaten our safety, careers, emotions, health, or relationships? In this pragmatic and practical book, experienced life coach and former psychotherapist Eileen Lenson shows us tools to turn suffering into hope and develop resilience by combining scientific research with an understanding of our emotional and spiritual lives. Eileen Lenson, MSW, ACSW, Board Certified Coach, has committed her professional career to helping people who are struggling with adversity. She is based in California and holds a Masters degree in Clinical Social Work, and prior to becoming a Professional Life Coach, was a practicing psychotherapist for over 20 years. Her broad experiences range from working with clients in medical and psychiatric hospitals, to her outpatient private practice. She has also developed and led support groups for parents who suffered the loss of a child, for couples going through a divorce, and for teens with social adjustment problems. In addition to her clinical work, she has spoken internationally on grief and bereavement. 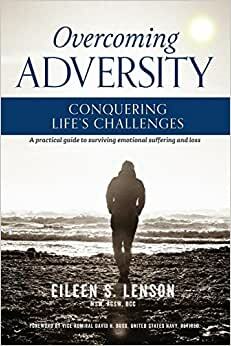 Author of a business book on psychotherapy and a chapter in a three-part volume on psychological trauma, Eileen has also written for newspapers and monthly columns, and taught seminars on adversity-related topics. 5.0 out of 5 starsGreat for everyone! This is a wonderful book. It's an easy read and combines stories of real life adversity with a positive and empowering strategies for enhancing resilience and emerging from challenges stronger and in many ways, happier. I love the practical tips and that the content draws from research in positive psychology as well as both the author's professional experience and her interviewee's personal stories. It's a great resource for everyone. Both in bookstores and online, there are plenty of “self help” books, and there are certainly plenty of good ones. Here is why Eileen Lenson’s book is unique. In the final analysis, most authors’ advice is essentially to adopt a positive outlook as opposed to a negative outlook on life. Good advice, but easier said than done. If it were that easy, there would be no need for so many books on the subject. “Overcoming Adversity” is at its heart a “practical” book. It doesn’t just give platitudes. It discusses in detail the most prevalent issues relating to overcoming adversity, and then outlines a simple structure as to how to accomplish that employing realistic avenues. The beauty of the book is that every issue is structured, outlined, and explained using the same template, chapter by chapter. So, one does not have to memorize the book. It can be used as a reference forever by going to one section or another that has meaning to your current situation. One might say that the book teaches one how to respond to adversity rather than to react to it. It can make all the emotional difference in the world. 5.0 out of 5 starsI highly recommend this read! I hadn't even completed Chapter One on "Forgiveness" when Ms. Lenson's Overcoming Adversity already changed my life for the better. Her words of wisdom inspired me to take the high road and resolve a sibling situation for which I was experiencing great angst. Forgiving my sister was the absolutely the right thing to do, and this simple act has helped our relationship to not only grow, but immensely improve. This outstanding book is well written and highly organized. As a teacher, I honestly see it not only as a great personal resource, but know it would be a perfect fit in a secondary or post-secondary human relations class, and/or featured in a lecture series. The people Ms. Lenson interviewed were fascinating, and the struggles they shared in the book could have led them all to give up. Instead they all have that piece that allows one to push through and perservere. Lenson's book examines the steps one can take to do that too. You don't need to be an elite athlete to overcome obstacles. Instead by following this advice you can get there yourself. Whether you're dealing with a profound loss or every day ups and downs, "Overcoming Adversity" is a wonderful resource for moving forward. Chocked full of inspirational stories, wisdom and studies, I found myself underlining passages for later review. It's the kind of book you'll want to keep on your shelf and refer to again and again.